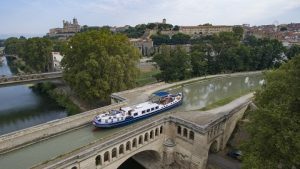 European Waterways have announced a limited time Black Friday special of 30% off on select 6-night all-inclusive hotel barge cruises in Europe for spring 2019 when booked between November 23rd and November 27th, 2018. The promotion represents savings of up to €14,970 and charters as low as €19,880 during one of Europe’s most picturesque times of the year, when the countryside begins to burst into bloom. European Waterways cruises are all-inclusive and feature local transfers to and from the hotel barge to a designated area, all meals on board, an open bar with a large range of premium alcoholic and non-alcoholic drinks, all wines served throughout the cruise, excursions and admittance fees as per the itinerary, the services of a crew, as well as free use of barge facilities, such as bicycles. Under Black Friday rates, the April 28, 2019 departure of the 8-passenger Anjodi on the Canal du Midi can be chartered for just €22,960, a saving of €9,840 off the regular €32,800 price. Cruise highlights include a private wine tasting at the 14th century Château de Perdiguier and a visit to the hilltop village of Minerve, a well-preserved medieval village surrounded by a network of cliffs and natural bridges. The April 14, 2019 departure of the 8-passenger Scottish Highlander can be chartered for €19,880, a saving of €8,520 off its regular €28,400 price. Highlights include a tour of the Glen Ord whisky distillery with a private tasting and a Birds of Prey demonstration on the banks of Loch Ness. Other eligible charters include the April 14, 2019 departure of the 8-passenger L’Art de Vivre in Burgundy, which is available for €20,020, a saving of €8,580 off the regular €28,600 price; the March 31, 2019 tulip cruise departure of Panache is available for €34,930, a saving of €14,970 off the regular €49,900 price. Cruise highlights on Panache include a visit to Keukenhof Gardens, where guests will see the largest display of flowers in the world, and a visit to the Aalsmeer flower auction, also the largest in the world. The March 31, 2019 departure of the 11-passenger La Belle Epoque in Burgundy is also eligible. The charter price is €34,930, a saving of €14,970 off the regular price of €49,900. Highlights include wine tasting of Chablis wines in the cellars of a renowned vineyard and a private champagne tasting at the boutique Maison Alexandre Bonnet. 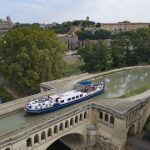 The savings are on select whole boat charters in France, including the Canal du Midi and Burgundy; on the Caledonian Canal in Scotland; and in Holland during the region’s renowned tulip season. Charters must be booked from November 23 through November 27, 2018 to be eligible for the Black Friday rates. The offer cannot be combined with other promotions and other restriction may apply.For more information visit europeanwaterways.com.